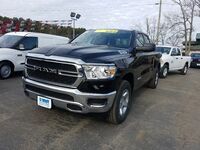 When choosing a new truck you have many options to pick between but two of the most stylish and technologically advanced trucks available to you are the 2019 Ram 1500 and the 2019 GMC Sierra 1500. Bold body structures of both these beautiful trucks portray an athletic and muscular road presence and their cabin comforts and amenities set them apart from the crowded truck competition. Take a closer look at the differences and similarities between the engine specs and interior cargo and passenger space of the 2019 Ram 1500 and the 2019 GMC Sierra 1500 right here below. 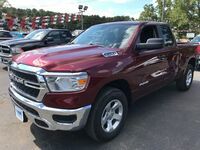 The 5.7L HEMI® V8 eTorque engine of the 2019 Ram 1500 also provides a Maximum Tow Rating of 12,750 pounds while the 5.7L EcoTec V8 of the 2019 Sierra 1500 can only tow a max of 12,100 pounds. 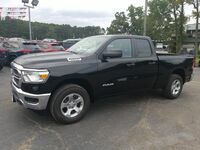 The standard engine of the 2019 Ram 1500 is a 3.6L Pentastar V6 that also provides more horsepower and torque than the standard 4.3L V6 of the 2019 GMC Sierra 1500. What are the Differences Between the 2019 Ram 1500 & the 2019 GMC Sierra 1500? 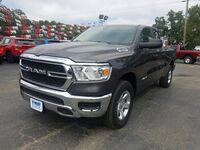 The 2019 Ram 1500 offers a Crew Cab or a Quad Cab while the GMC Sierra makes a Crew Cab, Double Cab, and Regular Cab available. All cabin choices for both the 2019 Ram 1500 and GMC Sierra have the option of five or six-passenger seating with the exception of the GMC Sierra Regular Cab which only has room for three people. 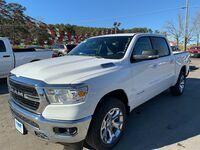 However, the 2019 Ram 1500 Crew Cab provides passengers with more rear legroom, shoulder room and hip room than the 2019 Sierra Crew Cab does. Both the 2019 Ram 1500 and the GMC Sierra 1500 also make available multiple bed length options for optimal cargo convenience but the Ram 1500 also provides a standard overhead console, rear under seat storage, and an in-bed trunk for even more ingenious storage solutions. With a more powerful engine and better interior passenger and cargo space the 2019 Ram 1500 wins a hard-fought battle over the 2019 GMC Sierra 1500. 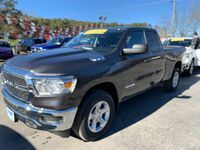 Come and take the 2019 Ram 1500 for a test drive today at Cowboy Ram in Clinton, AR to experience all of the exciting specs and features of the Ram 1500. 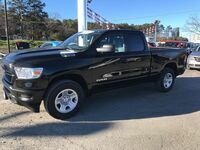 Interested in a 2019 Ram 1500?